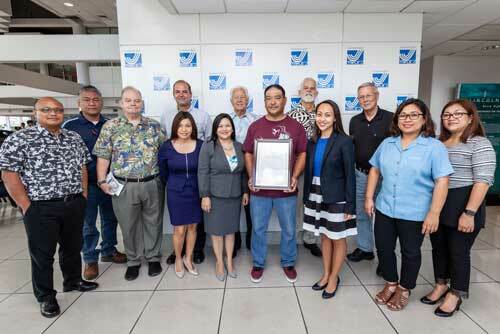 On August 10th, Senator Regine Biscoe Lee presented a Legislative Resolution on behalf of the 34th Guam Legislature, recognizing Ben Sablan, Delivery Driver for Triple J Five Star Wholesale, for his heroic act on March 26th, 2018. Sablan had come to the aid of an injured driver at the Dededo 76 gas station, along his daily route to the Five Star warehouse in Dededo, when he was flagged down to assist a man pinned between a fuel tank truck and a concrete retaining wall. According to bystanders at the scene, no one knew how to operate the truck that pinned him, so without hesitation Sablan jumped into the driver’s seat and backed the truck away so that first responders could perform life saving aid and transport him to the hospital. His brave, selfless actions were instrumental in preventing further injury. Additionally, Sablan was recognized at GHRA’s Annual HERO Awards as a nominee for the 2018 Life Saving Award for his heroic act. Present alongside Ben Sablan, was his family and the executive and management team of Triple J Enterprises, Inc.
Left to right, back row: Alfred Bantugan, Warehouse Manager, Triple J Five Star Wholesale; Jim Herbert, General Manager of Triple J Five Star Wholesale; Mr. Robert Jones, Chairman and CEO of Triple J Enterprises, Inc.; Jeff Jones, President and COO of Triple J Enterprises, Inc.; Kent Douglas, Senior Operations Manager, Triple J Five Star Wholesale. Left to right, front row: Edgar Aguilar, Director of Tax and Compliance, Triple J Enterprises, Inc.; Keith Toy, Purchasing Manager, Triple J Five Star Wholesale; Mary Rhodes, President of the Guam Hotel & Restaurant Association (GHRA); Yolanda Padrones, HR Director, Triple J Enterprises, Inc.; Ben Sablan, Delivery Driver, Triple J Five Star Wholesale; Senator Regine Biscoe Lee, 34th Guam Legislature; Jane Valdez Laygo, Customer Service Manager, Triple J Five Star Wholesale and Cora Santiago, HR, Triple J Five Star Wholesale.